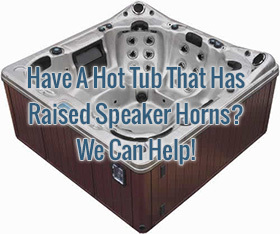 Over the years, hot tubs from a variety of manufacturers have been made with raised speaker housings. Because covers typically sit flush with the acrylic shell, these raised speakers have always presented an issue that needed to be overcome. As an owner of such a spa, you realize that the foam core is contoured and cut away from the speaker area and hoods are sewn into the cover to go over them. The key to this is the cover manufacturer having the correct pattern on file. Our manufacturer has built directly for some of manufacturers and has patterns for many others as well. If you have one of these spas and need a new cover, give us a call at (800)823-3618. 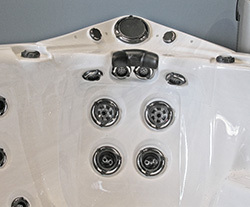 LA Spas, Coast Spas, Catalina Spas and Dynasty Spas have	been at the forefront of building hot tubs that featured these speaker horns that rise above the normal plane on which the spa cover normally sits. Our manufacturer has built directly for Dynasty Spas and has made many covers for the rest of these spas as well. If you own a spa by one of these manufacturers, we may be able to help. Call us today!